China has steeped ups it charm offensive in the Middle East in recent years. In December 2010, Chinese Premier Wen Jiabao spent five days in Syria signing deals and doing things like planting olive trees in the Golan Heights. In Syria, China has moved in and tried to take up a position long occupied by the Soviet Union. In Turkey and even Iraq China seems to be moving in and filling a void as the United States pulls back. In Turkey, which is a NATO member, Chinese warplanes were included in a military exercise. In June 2011, China welcomed Sudanese leader Omar al-Bashir on a state visit and gave him red-carpet treatment that included a meeting with Chinese President Hu Jintao in the Great Hall of the People and the signing of several oil and gas deals. At the time Bashir was wanted by the International Criminal Court on genocide charges for orchestrating atrocities in the Darfur region. China appears to be positioning itself to enjoy the windfall of repairing and rebuilding Iraq and Afghanistan when the hostilities abate there and the United States and European countries leave. In November 2009, CNPC (China National Petroleum Corporation) and BP promised to invest $50 billion in developing the Rumalia oil field in Iraq, a plan that could triple the oil field’s output. It was the first big oil deal announced in Iraq since the 2003 invasion. In 2007, the state-run Metallurgical Corporation of China (MCC) won the right to develop the Aynak copper field south of Kabul. Part of the $3 billion deal was a promise to build a coal power plant and Afghanistan’s first freight railway. In both cases it appears that China was able to win the deals and get a jump on its rivals because of willingness to put up with security risks. MCC is also bidding on a iron deposit west of Kabul. China has given scholarships to students from Middle East nations, let Middle East charities open up mosques in Muslim areas of China and trained hundreds of Arab professionals in fields such as agriculture and biochemistry. The United States was not pleased with the arms deals that China made with Saddam Hussein’s Iraq, Sudan and Iran---country that have ben blacklisted for the alleged support of terrorism. China has good relations with Israel and its enemies. Israel is China’s second largest supplier of weapons after Russian China has invited Hamas members to Beijing. China is seeking oil and natural gas deals in Iran and Iraq and spending billion of dollars there. 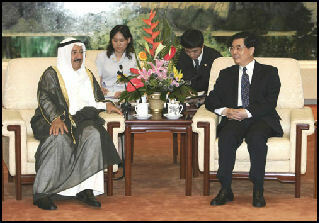 China earned some goodwill from Iraq when it forgave $8 million in Iraqi debt that dated back to the Saddam Hussein era. In April 2004, seven Chinese nationals were taken hostage in Iraq by insurgents. The seven were taken from the vehicle they were traveling in around Fallujah on the same day they entered Iraq from Jordan. The men did not work for the government or a Chinese company and were released unharmed with the help of a group called the Iraq Muslim Presbytery. At that time there were 10 Chinese companies with 40 employees working in Iraq. Eight Chinese were abducted and held hostages by Iraqi insurgents in January 2005. The militants threatened to kill the hostages and said they would be treated “mercifully” if Beijing “clarified its role” in Iraq banned all Chinese nationals from entering Iraq. The hostages were freed. A $1.2 billion deal with Iraq calls for the development of Ahdab oil field once the U.N. sanctions against Baghdad are lifted. China picked on a $1 billion oil and pipeline deal in Sudan after the U.S. company Occidental oil was prohibited from doing business there. China has taken measures to get Iran to negotiate on the nuclear issue but also held up the United Nations from reprimanding and imposing sanctions on Iran and generally prevented the world community from isolating Iran over the nuclear weapons issue. China has supplied intelligence to the international Atomic Energy Agency with intelligence linking Iran To making nuclear weapons. In April 2010, China sent an envoy to Iran as part of the international effort to put pressure on Iran to scale down its nuclear program. This came after China had shown reluctance in the past to put pressure on Iran. A month earlier China joined a conference call with five other major powers including the United States to discuss new sanctions on Tehran. By May 2010, the United States won China’s support for sanctions against Iran. China is one of the leading investors in Afghanistan. In 2007 it made the largest investment in Afghan history: $3 billion by China Metallurgical to develop the world’s largest untapped copper reserves at Aynak. China is also interested in Afghanistan’s oil, gas, iron and uranium. Many in the United States and Europe want to see China do more in Afghanistan on the military side: perhaps training soldiers or police as a minimum. In Afghanistan, the Chinese pressured archeologists to stop excavating a 2,600-year-old Buddhist monastery south Kabul because the excavations interfere with China’s development of the world’s second biggest unexploited copper mine. The Aynak copper mine is 50 kilometers outside of Kabul. As of late 2009, several hundred Chinese engineers were already there---behind a bomb-proof fence with American soldiers nearby---renovating the mine. The Afghan Mining Minister Mohammed Ibrahim Adel was accused of taking a $30 million bribe to award Aynak to MCC. Adel denied taking the bribe. Insiders say bribes were offered by several bidders. the United States and China share a common interest in Afghanistan: ridding it of militants and drugs. Thirty-two thousand Chinese---most of them working on construction projects or providing oil filed services---were stuck in Libya when unrest broke out there in early 2011. Beijing sent charter flights and ferries along with military transport planes to pull out Chinese nationals. China even moved a missile frigate to waters off Libya to protect citizens being evacuated. The in rest brought to a halt a half-finished $2.7 billion housing project and oil field work undertaken by the Chinese. China dispatched the frigate Xuzhou from off the coast of Somalia to the Libyan coast to help evacuate Chinese citizens in Libya. The move has attracted widespread attention because it was a dramatic demonstration of how the Chinese government intends to use its expanding naval power around the world. Keith Bradsher wrote in the New York Times, “China’s departure from its usual reticence toward political opposition groups has prompted significant discussion among experts on China’s foreign policy, with the main focus on the country’s shift from being an oil exporter as recently as the early 1990s to importing half its oil now. “It’s unusual for them to negotiate with anyone other than the incumbent government, but clearly China has oil interests,” said Ben Simpfendorfer, the managing director of Silk Road Associates, an economic and political consultancy in Hong Kong that focuses on China’s relations with the Middle East. Libya was a large oil exporter until the recent civil conflict halted shipments. China has consistently preached nonintervention in recent years and has opposed international efforts to put pressure on even repressive governments like those in Zimbabwe, Sudan, Myanmar and North Korea. When the United Nations Security Council voted in March to authorize airstrikes against Colonel Qaddafi’s forces to prevent them from killing civilians in opposition areas, China was one of five countries that abstained. Strong criticism of Colonel Qaddafi by other Arab countries, like Qatar, as well as efforts by African leaders to negotiate a settlement in Libya may have made China more willing to depart from its usual practice of avoiding contact with opposition groups, Mr. Simpfendorfer said. China buys half of its oil and gas from the Middle East, and now buys more oil and oil products from Saudi Arabia, for example, than the United States does. China also buys sizable quantities of oil from Libya, although less than it buys from Saudi Arabia. China purchased $4.45 billion worth of Libyan crude oil last year, according to data from Global Trade Information Services Inc., a data service based in Columbia, S.C. In March 2011, China warned both sides in Syria to shun violence but also told the international community “not to interfere.” The official Chinese government newspaper, the People’s Daily, called U.S. Secretary of State Hillary Clinton “super arrogant.” for criticizing China’s position on Syria. Yet China’s economic growth and associated need to secure resources increasingly have been at odds with this long-standing policy of being aloof. That’s especially true in the resource- rich region that stretches from the Atlantic coast of Africa to Central Asia and the subcontinent, much of which is now in revolt. Over the past year, a series of incidents in the region have tested China’s non-interference policy, but without serious damage to the country’s image. With China’s veto of the UN resolution on Syria, Chinese determination to cling to a principle rooted in 19th-century diplomacy seems set to backfire. The Arab revolt is certain to force not only a revision of China’s policy of non-interference but also of the employment practices of Chinese companies. With new and long-standing governments in the region desperate to reduce unemployment -- a key driver of the revolts -- authorities in Libya and elsewhere are likely to demand that Chinese construction companies employ local, rather than imported, labor. The need for a revised approach to the Middle East and North Africa, as well as countries such as Pakistan and Afghanistan, will become increasingly clear as China boosts its investment in Central and South Asian nations before the scheduled 2014 withdrawal of U.S. forces from Afghanistan, where China has secured oil and copper rights. Reports that China is considering establishing military bases in Pakistan’s insurgency-plagued northwestern tribal areas near the border with Afghanistan, and a naval base in the Balochistan port city of Gwadar, could create further pressure for change. China holds the Pakistan-based East Turkestan Islamic Movement responsible for attacks last year in Xinjiang’s city of Kashgar. Defeating the movement is key to Chinese plans to keep regional trade and energy flowing, and the bases in Pakistan may tempt China to take on a role as local policeman. If it takes an event to drive a change of China’s foreign policy, Yemen may prove to be the spark. With $355 billion worth of trade with Europe and a quarter of China’s exports traveling through Bab el Mandeb -- the strait that separates Yemen from Somalia and Djibouti -- China cannot afford a collapse of law and order in Yemen. The crisis-ridden country is countering multiple threats, including an al-Qaeda insurgency after mass protests and intercommunal fighting that forced the resignation of President Ali Abdullah Saleh and paved the way for elections later this month. China has breached its non-interference policy to respond to these pressures in the recent past. Its deployment of naval vessels off the coast of Somalia to counter piracy, for example, constituted the first Chinese venture of its kind. But China’s status as an emerging economic superpower demands that it become a more muscular global actor to pursue its interests. Ultimately that will mean taking positions on domestic disputes and conflicts around the world that have a bearing on China’s global national-security interests, the very opposite of the stance it adopted on Syria. Similarly, China will need to maintain military bases in key regions that serve to secure Chinese demand for natural resources, and to satisfy domestic calls to ensure the safety of its nationals abroad. China has showed a strong interest in Latin America, where is has signed deals to develop Venezuelan oil fields and Bolivian gas fields and invested in a Brazilian steel mill and copper mines in Chile and Peru. It is also buying up soy beans and sugar. Between 2001 and 2005, trade between Latin America and China grew at a 20 percent annual rate. China and Brazil's bilateral trade surpassed $56 billion last year, up from $2.3 billion a decade earlier. In 2009, China replaced the U.S. as Brazil's biggest trading partner. Venezuelan President Hugo Chavez visited China in September 2008 and offered to sell China more oil. China is Australia’s largest trading partner. In June 2011, Australian Prime Minister Julia Gillard ruled out meeting with Dalai Lama. In diplomatic cable revealed by Wikileaks, Former Australian Prime Minister Keven Rudd described Chinese leaders as “paranoid” about Taiwan and Tibet and told the United States to use force against China “if everything goes wrong.” Rudd is a Mandarin-speaking former diplomat who was posted for a while in Beijing.